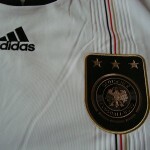 The two shirts released for 2009-2011 – and the 2010 FIFA World Cup in South Africa – were clearly created for a German squad that had turned the corner. 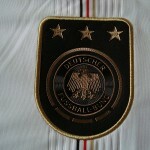 The two designs were traditional yet modern – space-age even, with the new metallic national eagle badges. 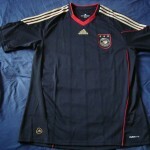 The old gold that had crept into the designers’ colour palette had now completely replaced the more established yellow-gold that had appeared on all German shirts in some shape or form since 1987, and the second shirt also saw things go back to black – perhaps Jürgen Klinsmann’s red was not so intimidating after all. 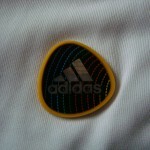 The white design that debuted in November 2009 against the Côte d’Ivoire was truly a modern masterpiece. 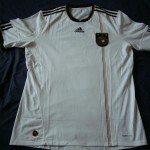 There were two actual shirts – a fitted version used by the team’s musclemen and showoffs like Lukas Podolski and Bastian Schweinsteiger, and a looser-fitting and more traditional version sported by more relaxed types such as Miroslav Klose and Thomas Müller. 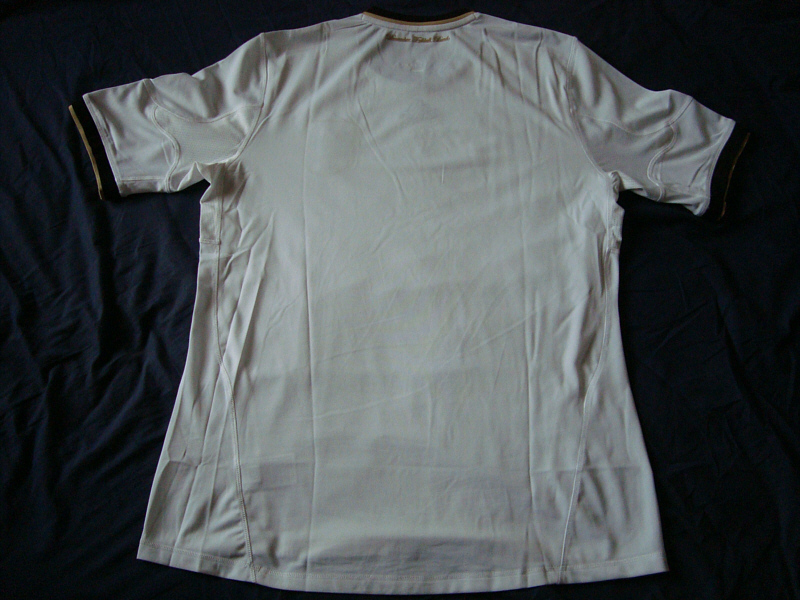 Given that most Bier-drinking and Wurst-eating fans were never going to want to strut around in some skin-hugging outfit, the standard replica shirt had the more traditional cut. 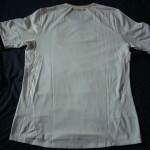 The shirt has a number of unique features, but none of these are significant enough to upset the balance of what is essentially a clean and simple design. 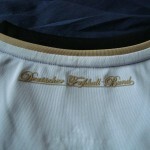 It is plain white apart from three very thin Schwarz-Rot-Gold vertical pinstripes on the right (the wearer’s left) that extend from the shoulder down to the bottom – with the gold now being the slightly paler old gold. These very subtle pinstripes sit within a neat ribbed fabric area that in turn sits neatly behind the dramatically restyled national eagle and championship stars, all now integrated into a metallic shield on black fabric. 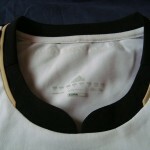 Across the shoulders are the three trademark Adidas stripes in black, with spaces for the appropriate competitition logos that players no have to wear during tournament matches; the black collar has a round, scalloped style that pays homage to the shirt worn by the winning side of 1954, and is neatly piped in old gold. 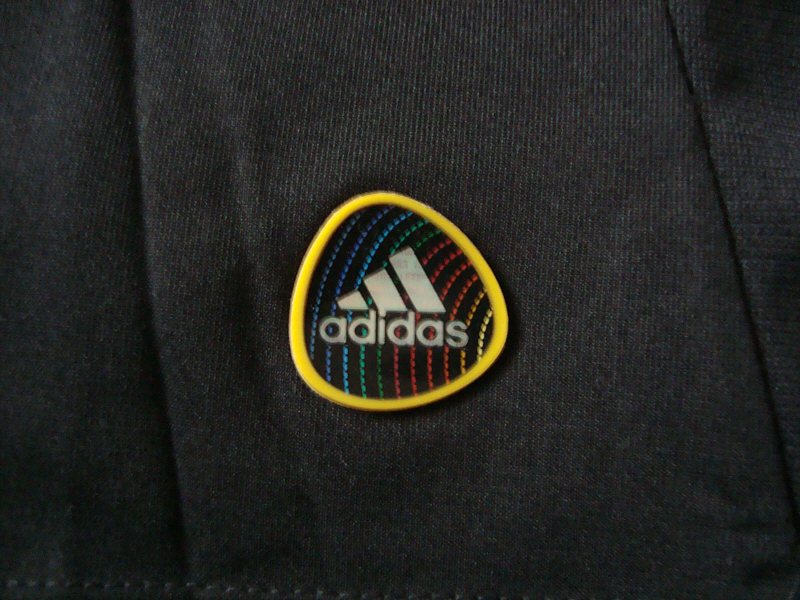 Immediately below the neck is the Adidas logo, woven in black thread, while at the base of front of the shirt are the new “Climacool” logo and the Adidas “Jabulani” hologram. 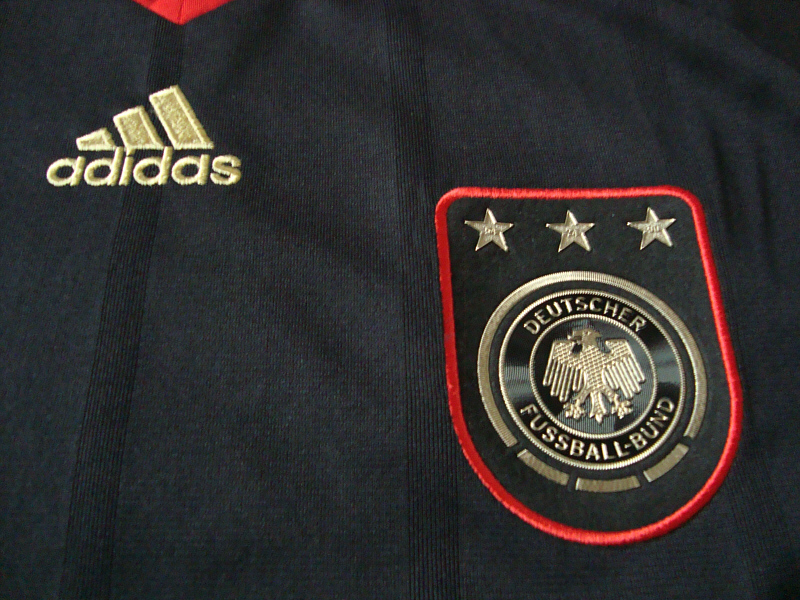 Then there’s the striking metallic national eagle and three championship stars, the feature that provides this otherwise traditional-looking Nationaltrikot with its futuristic, space-age feel. 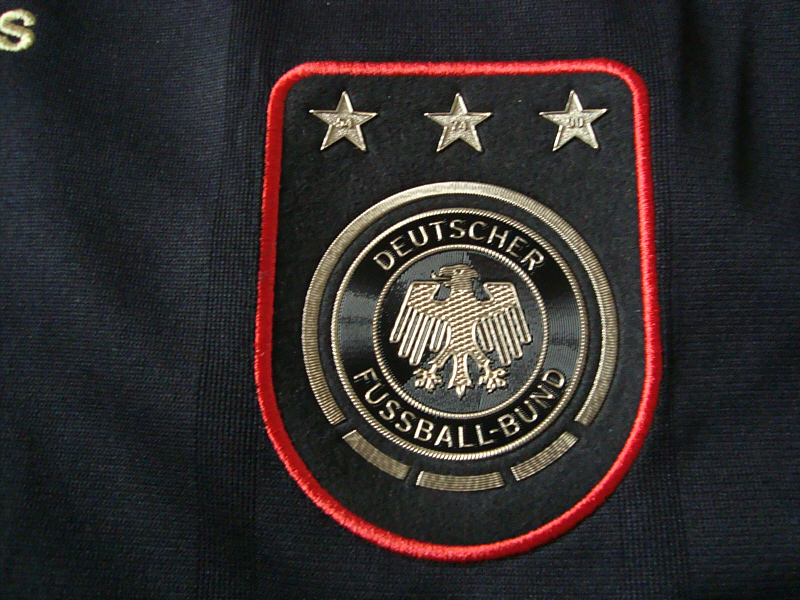 Etched in old gold metal, the stylised eagle and “Deutscher Fussball-Bund” roundel is slightly smaller than usual; this sits inside a thicker third outer circle incorporating the the three blocks that would usually carry the national colours. 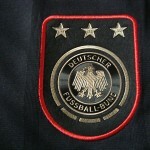 Above the circular logo are the three gold championship stars, each of which mark Germany’s three FIFA World Cup victories – 54, 74, 90. 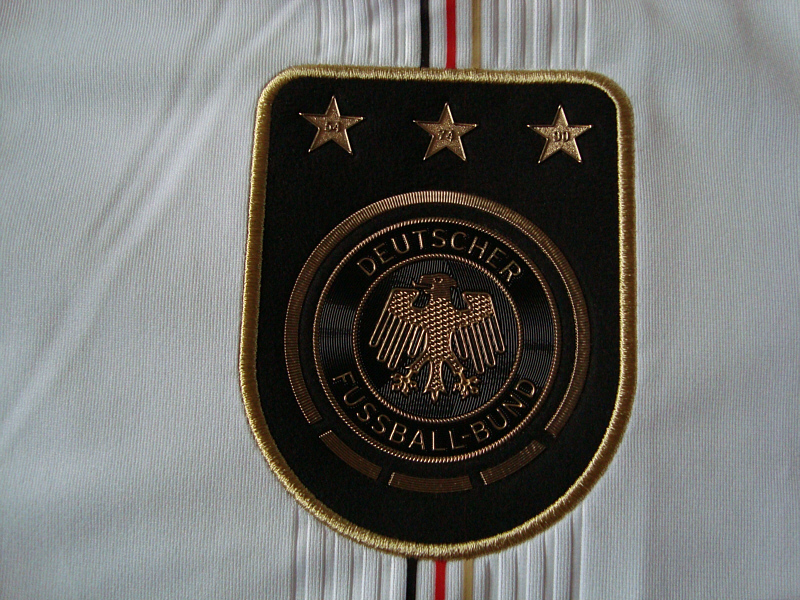 The roundel and stars are themselves on a thick black felt-like fabric background, which is attached to the shirt with fine old gold thread. 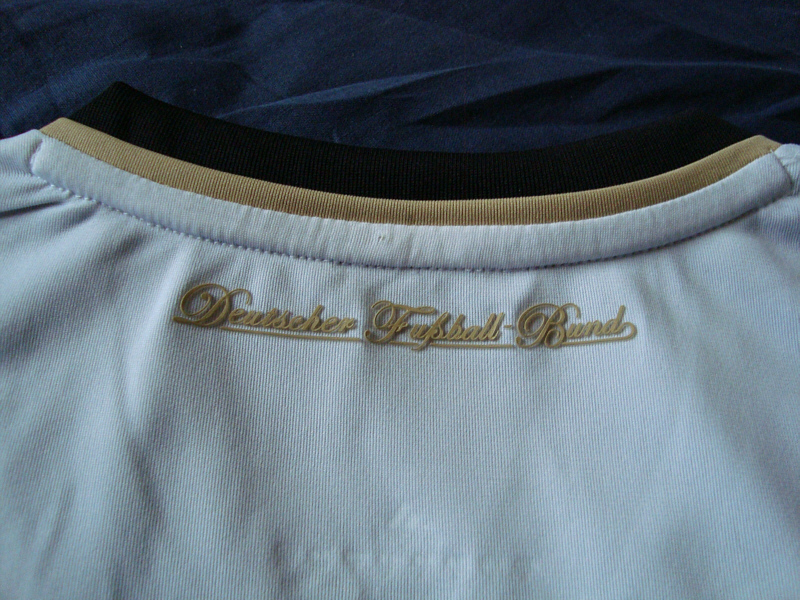 The back of the shirt is wonderfully free of design overkill clutter, save for a stylised “Deutscher Fußball-Bund” legend in cursive script in old gold that is situated just below the neckline. 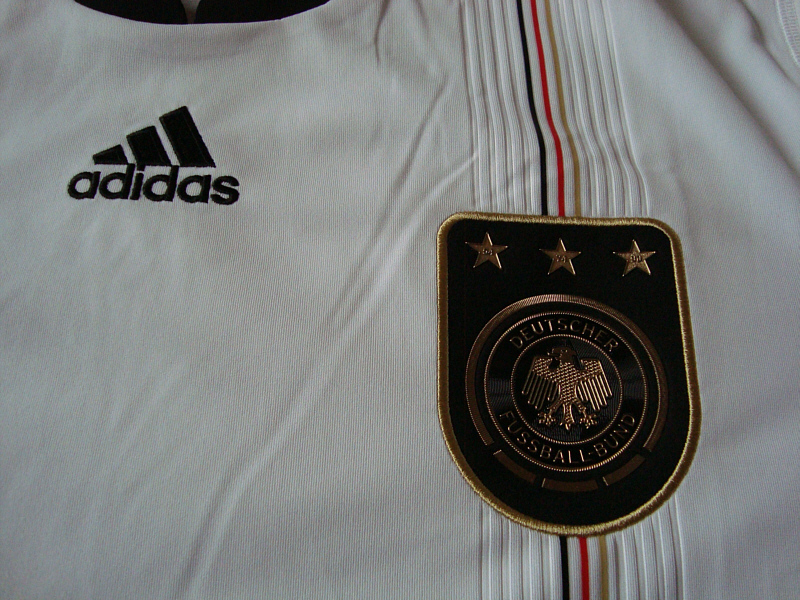 Like the shirt, the shorts are very simple – just plain black with the three stripes in white, and with the “shield” national crest on the wearer’s right leg. 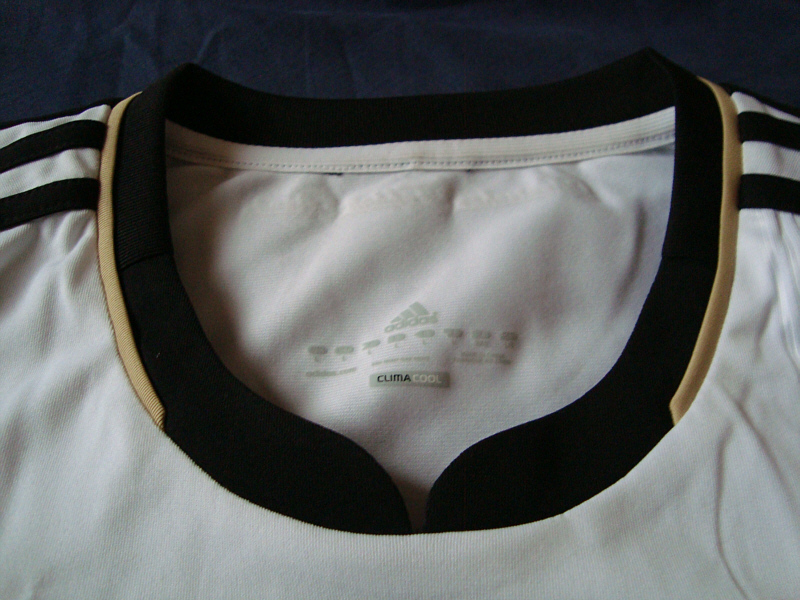 The white socks completing the Trikot have a black foldover, with the three horizontal bands in white; there is a stylised “DFB” (in the same script as the legend on the back of the shirt) at the front and the Adidas symbol at the back – both in black. 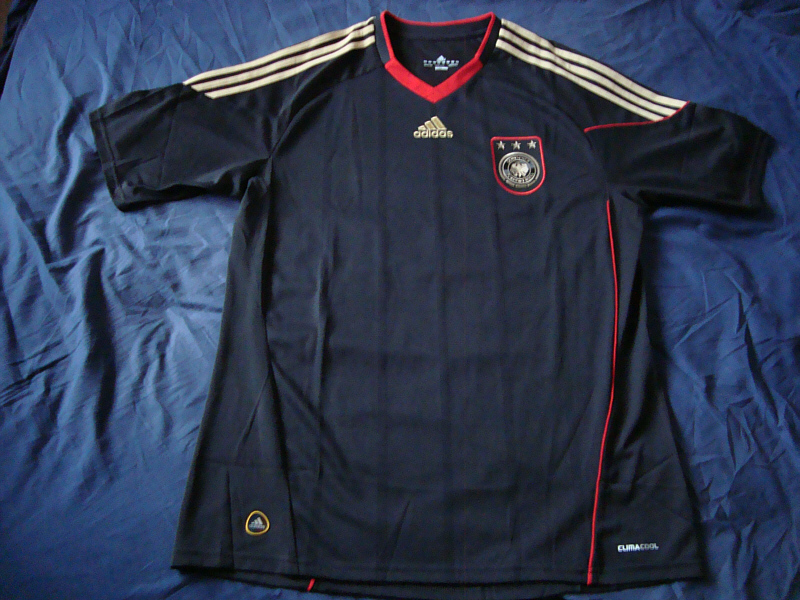 I am sure that better moments are to come, but my favourite moments involving a Germany team in this shirt up to this point has to be their 4-1 thrashing of England in Bloemfontein in the World Cup second round. 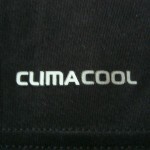 The player I’d most associate with this shirt has to be the man who scored two goals in that tie, FC Bayern’s Thomas Müller. 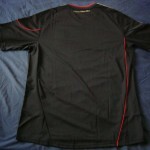 Having worn a red second shirt from 2005, things would go back to black in 2010. 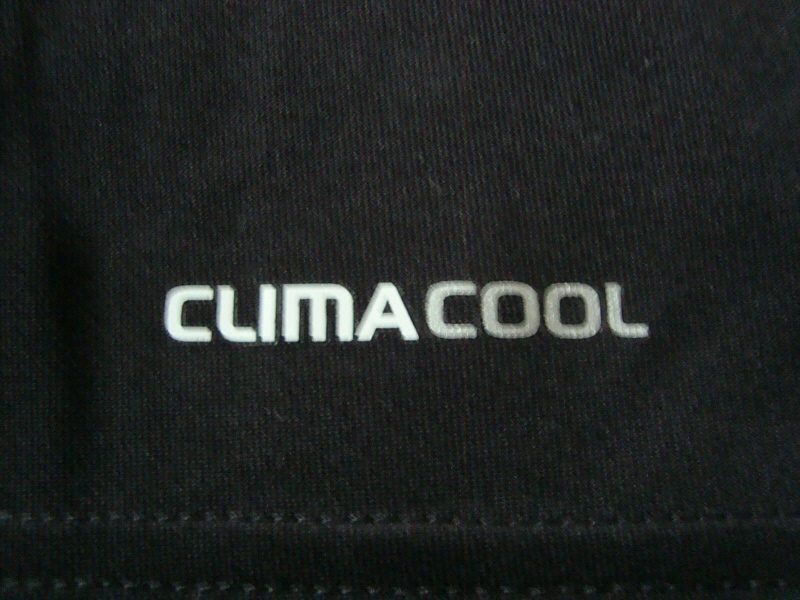 Like the white home design, this new black second shirt is a traditional yet modern look, with a number of unique features including the new “metallic” national eagle crest. 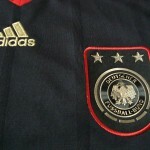 The announcement of the new black Nationaltrikot made more news in England than it did in Germany: although the German team had played in a black design as recently as 2005, it didn’t stop some sections of the British media from providing its brain-dead readership with its usual asinine take on things and the predictably tiresome references to the Second World War – while at the same time likening Michael Ballack to an SS trooper. 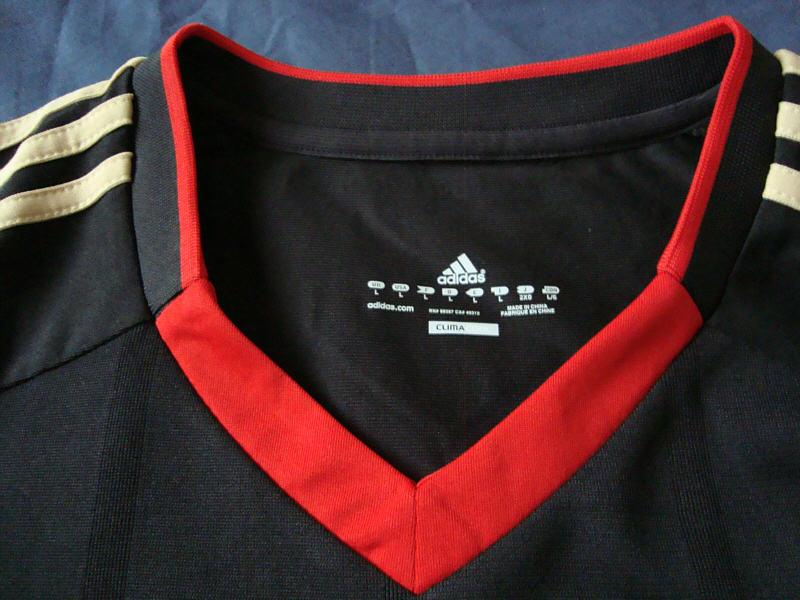 As with the white home shirt, the basic design of the black garment is fairly simple – plain black with a very subtle wide “watermark” pinstripe with a thin band of dark red piping running from the shoulder down to the base on both the front and back, with same dark red shade also appearing on the tidy v-necked collar. 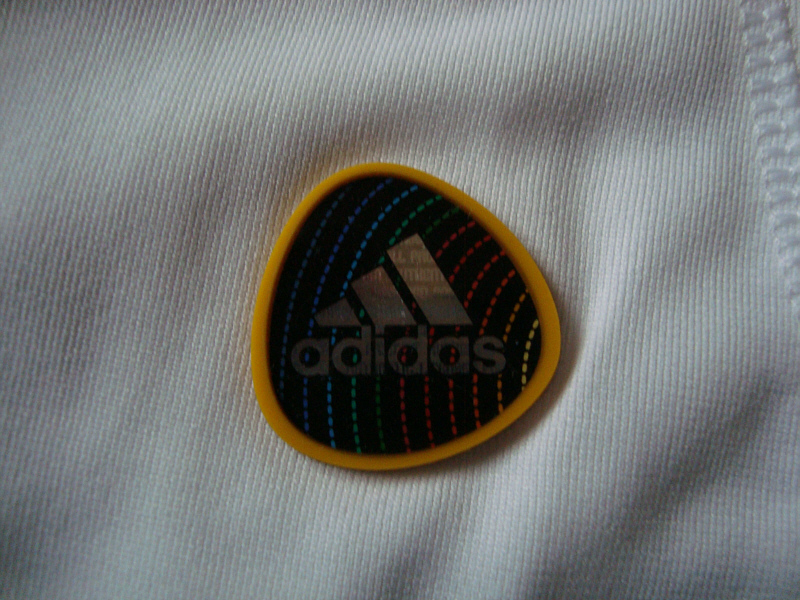 As with the home shirt, the new slightly paler old colour is used extensively in the design – three old gold stripes adorn each shoulder, and the Adidas logo immediately below the v-neck is woven in old gold thread. 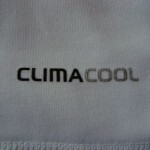 The new “space-age” style national eagle and championship stars are identical to that on the white shirt, but with the fabric shield stitched to the shirt in dark red thread; at the bottom of the front of the garment are the “Climacool” logo and the Adidas “Jabulani” hologram. 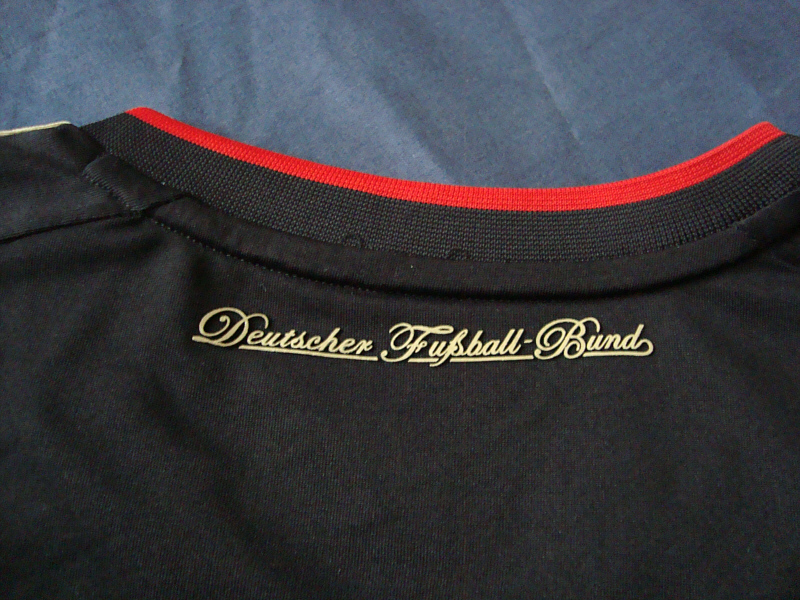 On the back of shirt, as with the white version, is the stylised “Deutscher Fußball-Bund” in cursive script. 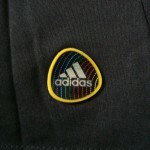 The white away shorts feature Adidas’ three trademark side stripes in black, as well as a thin band of red piping designed to provide a line of continuity from the same colour piping on the shirt. 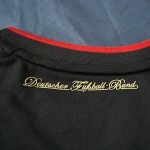 As with the black shirt, the white shorts features the new-style national crest and stars in a shield bordered with dark red thread. 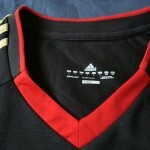 The black away socks have three horizontal bands in old gold at the top, and two vertical dark red lines at the front and back – with the stylised “DFB” at the front and Adidas logo at the back. 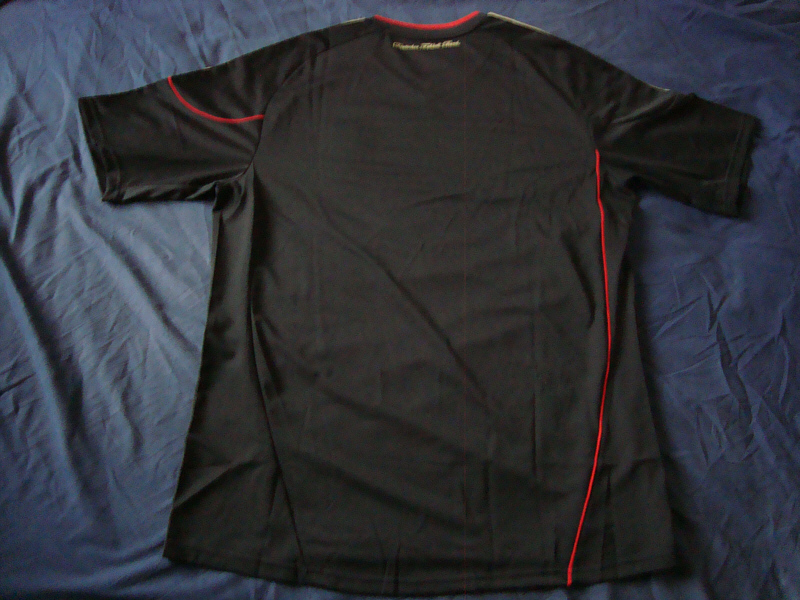 While the second shirt was designed to be worn with the white shorts, during the World Cup finals the Nationalmannschaft teamed it up with the home shorts to create an all-black ensemble that was worn in all three of their games as the “away” side. 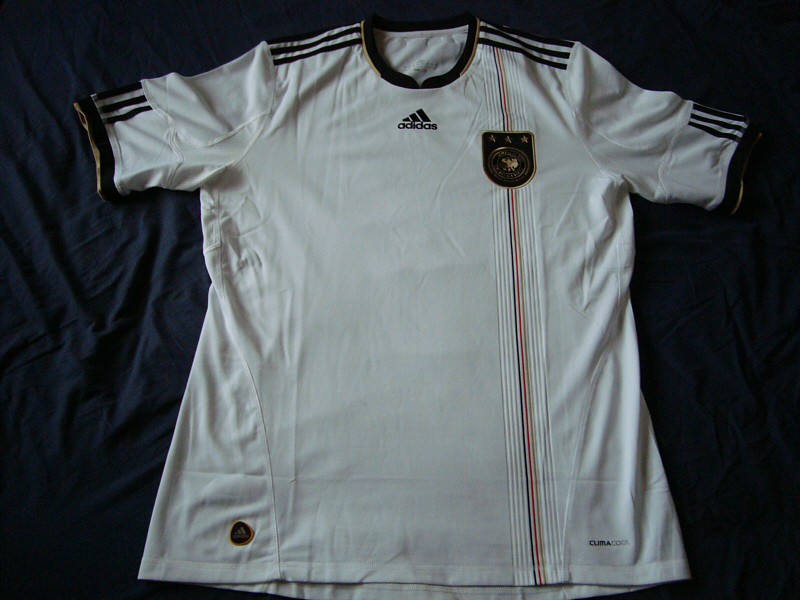 The one game thats stands out when this shirt was worn was for me the under-pressure game against Ghana in Johannesburg, which was won with a stunning strike by young Werder Bremen starlet Mesut Özil; the 4-0 battering of Argentina in the quarter-finals runs it close though. 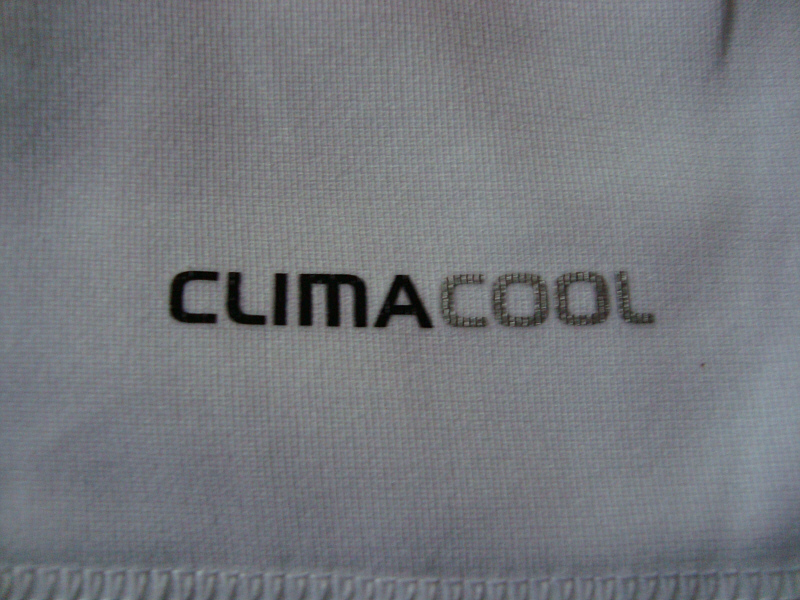 White: v Côte d’Ivoire, 18.11.2009, Gelsenkirchen. Black: v Argentina, 03.03.2010, München.